The 2019 Southern Cross will again be based out of the beautiful Montaluce Winery in Dahlonega, GA. As far as the course, expect a variety of terrain consisting of mostly gravel, with some grass and possibly singletrack sections (weather permitting) sprinkled in. The course is around 55 miles with two major, sustained climbs and two long, high speed descents. For all the latest race news, join our Southern Cross Facebook page. 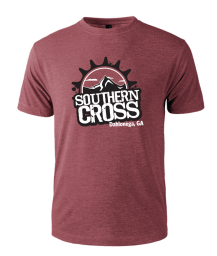 Southern Cross is part of the Terrapin Southeastern Gravel Series! We are excited to announce that we are teaming up with Chainbuster Racing to again make the 2019 Southern Cross Ultra Gravel Grind part of the Terrapin Southeastern Gravel Series! The 2019 Terrapin Southeastern Gravel Series features seven Ultra-X gravel races in Georgia and Alabama. Each race has a different style course with unique character and challenges that will require a well rounded racer to take home the series title and Chain Buster hardware. To compete for series prizes, racers must enter 5 races in a single season. Points-series results are calculated based on a racer’s 5 best finishes from all Ultra-X races. The SGS Series ends with prizes and raffles at a banquet at the Series Finale Race in November. The address of the start/finish is Montaluce Winery, 946 Via Montaluce, Dahlonega, GA 30533. Please follow arrow signs to start/finish once you turn into the Montaluce property. Please Note: There is no race day registration for this event. All registrations or transfers must be completed by Wednesday February 27 at 8 pm. If you have questions, changes, or need to speak with the Race Director, please email lisa@mountaingoatadventures.com directly before February 27. We will not be able to accommodate any changes on Saturday morning. 9:00 am - NOTE NEW TIME!!! Drop bag cutoff - Drop bags will leave the venue promptly at 9:00 am...if you miss the cutoff you will need to carry your drop items or rely on the aid stations for fuel. Drop bags may be pre-packed in your own bags, or there will be ziploc bags and sharpies available at registration. If you pack them at home, gallon size ziplocs are fine. Please ensure your bottles do not leak as they make a mess in your bag and inside the transport bins. All racers must complete the entire course and be in by 5:30pm to have an official finish time. There will be time cutoffs at the aid stations to ensure you can make it back by 5:30pm. Awards will be presented near the finish line when the top 5 finishers in each class have crossed the finish line. Approximate timing for awards will likely be 2:30 pm but this may change based on finish times. There is free, onsite primitive camping available at Montaluce Winery on Friday and Saturday night. If you plan to camp, you MUST RESERVE YOUR SPOT by emailing lisa@mountaingoatadventures.com no later than Feb 23rd. Please include the type of camping unit...RV, Sprinter, Tent or Sleeping in car/SUV, so we can ensure we have space for you. No ground fires are allowed so bring a camp stove if you plan to cook. NOTE THIS IS PRIMITIVE CAMPING - THERE IS NO WATER, ELECTRICITY, or OTHER HOOKUPS. THERE WILL BE PORTA-POTTIES ON SITE. Those camping in a tent or sleeping in their car will be able to camp in a nice, level grass field along the Etowah River. This is about 3/4 of a mile from the start/finish. Due to space constraints, no trailers or anything larger than a sprinter van will be allowed in this area. Those camping in RV's or pop-ups will be able to set up in one of the cul-de-sacs near the start/finish, also a mostly level area with plenty of room to spread out, as well as a porta-potty. We will utitlize the same camping setup that was used for Fool's Gold in 2018. The closest campground with amenities and is Etowah River Campground: 706-864-9035. Etowah River Campground is 2 miles from the race venue on quiet, back roads. There is also free primitive camping within the National Forest. For those looking for lodging in Dahlonega, the closest lodging is the Mountain Top Lodge: 706-864-5257. The Mountain Top Lodge is 4.8 miles from the race venue and offers a Bed and Breakfast atmosphere. Standard rooms are $110, Suite Rooms are $130 and Deluxe Whirlpool/fireplace rooms are $160. Please note they do not allow pets or children under 12. This is a small, quiet establishment with only 12 rooms so book early. Please let them know you are with the Southern Cross Mountain Bike Race. You can ride to the race venue from here via quiet country roads. The Holiday Inn Express is one of the nicer hotels in town and offers standard hotel rooms with breakfast: 706-867-7777. If you have a group coming, you can check websites such as AirBnb and VRBO for rental houses by searching "Dahlonega, GA". All racers will receive a super comfy cotton tri blend tee. The shirts are soft, lightweight and are likely soon to be your favorite. This year, we will be offering both men's and ladies cuts on the shirts. The ladies shirts feature are narrower/fitted, and slightly longer. Unisex/Men's shirts fit true to size, order up if you want a relaxed fit. Please register by the February 16th shirt size deadline to guarantee your size, especially if you would like a ladies shirt. 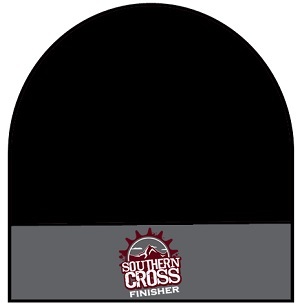 We will also be ordering finisher beanie hats for everyone who completes the course! 2019 Finisher Awards - Winter Knit Hat! All other podium finishers will receive prizes from the race sponsors, and we will likely go deeper in the open divisions with sponsor prizes as well. The larger the category, the deeper we will go with prizing. You can send one gallon-sized drop bag out to the aid station. Bring your own or we will have ziplocs that you can label and use. The better labeled it is with your race number, the quicker the volunteers can find your bag for you at the aid stations. You will have 2 aid station opportunities - it is a single Aid Station that you will pass by twice. The aid station will be at the top of Winding Stair Gap at the FS77/FS 42/FS 58 intersection. Aid Station will have water, Hammer Heed, bananas and a variety of snacks. Basic first aid supplies and mechanical support are also available at the Aid Station. If a race is canceled due to inclement weather, the points for that race will be made up at the series finale. The points from the series finale will be doubled it to account for the canceled race. Once your registration is processed, there are no refunds. Entries do not transfer from year to year and they do not transfer to other Mountain Goat Adventures events. If you get hurt or need to bail at the last minute, that is a major bummer, but we still need to pay the expenses associated with you racing regardless of whether or not you are able to attend. To help you out with this, you may sell your entry to someone in the same event without penalty (meaning no transfer fee) until February 25, 2019. You are responsible for finding someone to buy your entry as well as arranging payment with that person. Once you have all that squared away, please email lisa@mountaingoatadventures.com with the name and email for the person buying your entry, and I will send them a link to register. The person buying your entry will receive whichever shirt size you originally ordered unless you transfer before the shirt deadline.